Outside of its core ­encyclopedia, Britannica is widely known for offering K–12 materials to libraries. Original Sources, specifically designed for students in high schools and universities, adds to the company’s growing slate of products for higher-level learners (see britannicalearn.com/products). Original Sources hosts a growing collection of 420,000 items covering world and U.S. history, law, literature, math, philosophy, religion, and language arts, along with political, social, and hard sciences. Material can be viewed in several ways, as the clean, inviting homepage offers a single search box as well as links to advanced search. Other search options include Authors (Suggested Readings of Select Classic Authors), Topics (Selected Source Documents on Key Topics), Events (Great Events Told by Eyewitnesses and Historians), and Contents (Complete Outline of Original Sources Site). High school librarians will appreciate how the primary sources are highlighted in several ways here, but the most interesting browsing experiences, for both high school and college students, are found in the Events and Topics areas. These search options can also serve as springboards for research paper ideas. Events, for example, presents material in accessible groupings such as “Mesopotamian Empires,” “Key Events, 300–1,000,” and “American Civil War,” and subdivided into more detailed clusters as users click through the various options. Students who want to write about the Underground Railroad, for instance, can click on that subject and find information on people and happenings such as Harriet Tubman, the Fugitive Slave Act, and the Compromise of 1850. Some events naturally receive greater coverage than others, and more recent history is documented with more primary sources than early and prehistory, but users might be surprised by the amount of information on the Stone Age. The Events section offers work by historians as well as eyewitnesses. Information about the lives of our Stone Age ancestors is described in Jean François Albert du Pouget’s Manners and Monuments of Prehistoric Peoples, as well as in several articles. The Topics area includes links to historical issues such as “Women’s Suffrage,” “Decisive Battles of World History,” and “President Obama: Middle East Foreign Affairs,” and, in a more unusual grouping, to full-text works under document types, such as “Classic Christian Sermons, 380–873, CE,” “Writings on Astronomy,” and “Children’s Literature.” For example, selecting the topic of Landmark U.S. Supreme Court Cases leads to brief summaries of cases such as Roe v. Wade and Brown v. Board of Education. Under Authors, users will find a list of mostly Western, male contributors, though there is solid temporal diversity, from ancients such as Plato to relatively modern writers such as W.B. Yeats and L.M. Montgomery. This easy-to-navigate page allows for continuous scrolling through author’s headshots and portraits, making them easy to identify. As in the topics described above, clicking on an author’s name reveals links to the full text of his or her works, rather than merely secondary-source analyses—this is a real bonus for libraries. For ­example, selecting “Hans Christian Andersen” links to several of his famous fairy tales including The Princess and the Pea and The Ugly Duckling, along with excerpts from works of collected fairy tales. The interface is simple and easy to use, with the Google-like single search box on the homepage a welcome feature, as is the advanced search available as a secondary option. In advanced mode, it’s possible to specify title, author, date, “containing this exact phrase,” and “containing all these words” options, with clickable Boolean operators provided alongside to combine the choices in various ways. The Author, Topics, and other search categories remain available on every page of this database, so it will be easy for even novice users to find their way back to a beginning point or to start a new search. Also on the main pages are options to sort material in different ways, depending on the subject one is browsing; Topics, for example, are sortable alphabetically by popularity or time period. 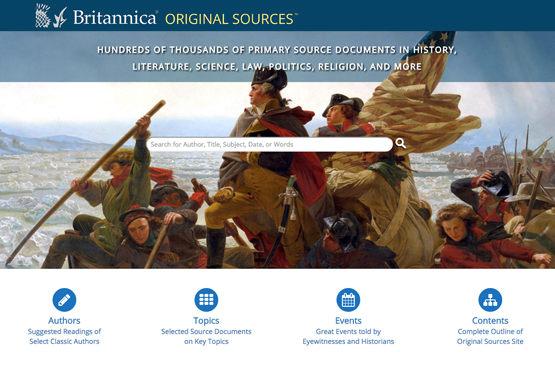 Within each of these sections, ­Britannica offers “categories” that will help students narrow their browsing to, for example, “must reads,” “speeches,” and “primary sources.” The categories are tailored toward the section being browsed. Once a user selects a document or book, several tools become available, including a drop-down menu that links to a table of contents, and arrows that allow users to navigate from page to page. In the top right of the page are several convenient features, some of which are standard—email, print, create a citation, and see related content. Less standard is the option to create a PDF of an entire work, which researchers will find particularly helpful, especially if the work is required course material. Original Sources is available through an annual subscription at .75¢/student/year; $750 minimum for each building within a library system. This is a growing resource, and it’s to be expected that the content will evolve to represent a greater diversity of genders and ethnicities. This is a carefully designed, quality database that students will find useful and usable. A worthwhile purchase. A free trial is available here. Britannica Digital Learning (BDL) provides reliable, high-quality solutions to strengthen student achievement and educators’ ability to teach to best practice. BDL experts produce curriculum-aligned resources for all ages from elementary school to college that make creative and purposeful use of technologies widely used in schools today. Products include: Britannica School, Britannica Academic, Original Sources, Pathways: Science, ImageQuest, and e-books. BDL is a division of Encyclopædia Britannica, Inc., with headquarters in Chicago. Reviewed by Henrietta Verma, School Library Journal. Review posted on 6/15/2017. For all press inquiries. please contact: bdlpress@eb.com.